Aviation news and information to keep you informed about learning to fly, aircraft management and Cirrus Aircraft announcements. We recently had the opportunity to fly into and play golf at Mountain Air Country Club in Burnsville, NC. Although my golf game was subpar, our approach footage came out top notch! Take a look! During a special ceremony on May 6, 2015, at McGhee Tyson Airport in Knoxville, Tennessee, Cirrus Aircraft Co-Founder and CEO Dale Klapmeier joined Tennessee Governor Bill Haslam and announced the expansion of Cirrus Aircraft to Knoxville with the new Vision Center. This Cirrus Customer Experience Center will be the central location for all Cirrus Aircraft pilot, owner and customer activities. This will also include sales, delivery, training, maintenance, support, personalization, fixed base operations and more for all Cirrus airplanes concentrating around the new Vision SF50 single-engine personal jet. The Vision Center will be the location for factory direct type rating training from Cirrus Aircraft. A key component of the SF50 training curriculum at the Vision Center is a Level D, full-motion flight simulator currently under development at CAE. This full flight simulator will be the cornerstone in Vision SF50 type rating training and annual recurrent training. In addition to factory direct training, the Vision Center will provide support for the new Vision SF50 and more than 6,000 SR aircraft. A design center will allow customers to personalize new and current aircraft. Research and development (R&D) as well as manufacturing operations for Cirrus Aircraft will remain in Duluth, Minnesota. All aircraft will continue to be produced at company facilities in Grand Forks, North Dakota and Duluth. The selection of Knoxville for the home of the Vision Center was the result of a thorough site evaluation process that included more than 15 states and 30 airport locations. McGhee Tyson Airport rose to the top and became Cirrus’ choice with the combination of a convenient location to the connected Cirrus owner base in North America, unique airport and area amenities, favorable weather and, most importantly, a welcoming community for Cirrus Aircraft employees and their families. Todd Simmons, Cirrus Aircraft Chief Customer Officer, will lead the Cirrus Aircraft Team at the new home for all Cirrus Aircraft customer activities and operations. V1 AERONAUTICAL NOW A CIRRUS TRAINING CENTER!! We are excited to announce our new title as the only Cirrus Certified Training Center in the Tampa/Orlando market! Our factory trained instructors and technologically advanced aircraft fleet allow us accommodate those who are interested in taking their flying to the next level. We look forward to growing this partnership with Cirrus Aircraft and welcome you to explore these opportunities with us! The Cirrus SF50 Vision Jet is the ultimate personal transportation vehicle and the first in it's class. It aims to offer the comfort and safety of the single engine SR-22, but in a package unlike any other. It has a maximum cruising speed of 300 KTAS, capacity for seven passengers, advanced Garmin Avionics Suite and the standard Cirrus Aircraft Parachute System. The second Vision Jet successfully completed it's first test flight on November 25. This airplane is really turning heads. I was lucky enough to see the first one up close and personal during my visit to the factory for the partner symposium in September. I'll keep you all updated as the progress continues. We would like to introduce you to the newest aircraft added to the V1 Aeronautical family. N834SR is a normally-aspirated SR-22 featuring the Avidyne Entegra PFD/MFD system with upgraded DFC90 autopilot. It is also equipped with factory air-conditioning, TKS Ice Protection, and the Standard Cirrus Aircraft Parachute System. 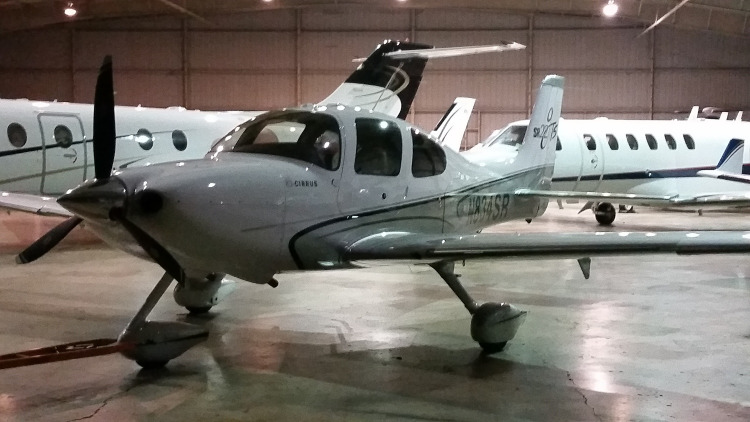 We're excited to add this impeccably-maintained aircraft to our rental and flight training fleet. Call or email today with your questions or comments! ADS-B FAA Mandate: What Do You Need To Know? The Federal Aviation Administration has already begun to implement their Next Generation Air Transportation System (or NextGen). The air traffic control system will be moving from a ground-based system to a satellite-based system in an effort to shorten air traffic routes, reduce delays and manage air traffic with greater safety margins. On October 19, 2014 the Federal Aviation Administration issued Order 8200.45. The order requires all aircraft operating in airspace that now requires a Mode-C transponder to also be equipped with ADS-B Out by Jan 1, 2020. What is Automatic Dependent Surveillance-Broadcast? How will the mandate affect you?